Intel Extreme Masters is South Korea-bound! As previously announced by Intel, StarCraft II will have its own stand-alone esports tournament ahead of the Olympic Winter Games 2018. The final event will take place in PyeongChang from February 5-7, 2018. 16 players, $150,000 on the line and the opportunity to be the first ever esports pros to step on a one-of-a-kind stage - what more is there to say! ESL and Intel are excited to unveil the regional open qualifiers, which are set to take place in December. 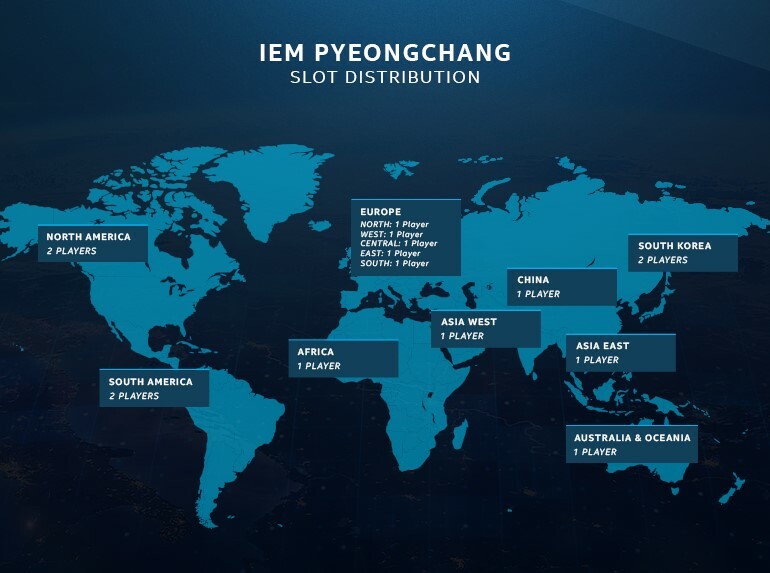 Take a look at the slot distribution for regions around the world below. To compete in your region’s respective open qualifier, head to the Intel Extreme Masters PyeongChang Qualifier Hub to find dates, rules and restrictions. Each regional qualifier is separated into two stages. The first stage will determine the eight best players from each region. Those that came out victorious in Stage 1 will move on to the second stage of the qualifiers. During Stage 2, the top 8 players of each qualifier will compete against one another for the coveted qualifier spot in the Intel Extreme Masters PyeongChang finals. Each region’s qualifier will take place over one or two stages, each with slightly varied formats based on anticipated player counts to determine the best players from each region. Let’s break down the formats for each region! The first stage will be played as a single elimination BO3, until the tournament reaches the RO16 at which point players will play a best of five series, and the winners will advance to stage two. The second stage is a double elimination best of three bracket. In regions with one qualifier slot (Oceania, China, and Europe), the grand finals will be played as a BO5 series where the player from the winner’s side of the bracket will begin with a 1:0 lead, and the winner of the tournament will qualify for Intel Extreme Masters PyeongChang. In regions with two qualifier slots (South Korea, North and South America), the upper bracket, lower bracket and grand finals will each be played as a standard best of 5 series, and both of the finalists will earn a coveted qualifier spot. If 9 or more players enter the qualifiers in these regions, the tournament will be played as a single elimination BO3 bracket that concludes with a BO5 final. In the event 8 or fewer players enter, the tournament will be played in the same fashion as the two-stage tournaments above: Double elimination BO3 bracket with a BO5 final, where the player from the upper bracket begins with a 1:0 lead. If you want to stay up to date regarding everything Intel Extreme Masters, be sure to follow IEM on both Twitter and Facebook. Don’t miss out - sign up to the qualifiers today! Good luck and have fun to all the participants!